And, it would appear, that today is just one such. Hurrah! The Germans announced one of their most important things today, nothing to do with their World Cup Squad either, oh no. They announced the 'biggest' board game prize nominees for the year. This is the time when everyone suddenly has an opinion on what they left out, what they included, and well, that obviously covers it! So, the German nation are backing one German game - unusually low - one French - quite brave for the Germans - and one Belgium game, bloody hell! 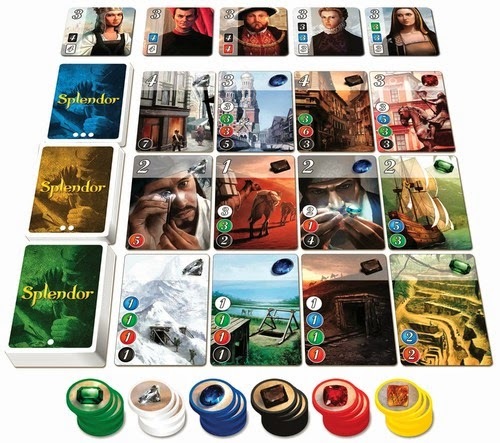 I back the French entry, Splendor. You may remember it comes in a huge box... but it plays wonderfully, is colourful, quick and Mrs Hora just got thrashed in quick succession twice this evening. The, there are the 'Gamers' Games' award. With people seeming to dare the committee to nominate Russian Railroads, one of the few games I've played that has left me completely underwhelmed, they gave it a nod only. The three games to have are apparently Istanbul, Concordia and Rococo. And it just so happens that I have them. Playing them is a different matter. Only Concordia has been played and after it's brilliant reception at Essen last year I didn't rush to buy it. But playing it was great, I enjoyed it a lot. I cannot really say then that one deserves it above another. At least most of the reaction has been funny! Could be yours for a small fortune. The other gaming related news is my latest escapades on ebay. If you're after a rare Subbuteo Zombie Team then now's the time to pick one up... Rochdale, Dumbarton, you're out to make me my fortune this week. We shall see. The initial reaction has been promising and with a load more to go on next week, more European, plus American - North and South - and National teams then who knows. The overdraft could be cleared once again.